Regression constitutes a very important topic in supervised learning. Its goal is to predict the value of one or more continuous target variables (responses) given the value of a -dimensional vector of input variables (predictors). More specifically, given a training data set comprising of observations , where , together with corresponding target values , the goal is to predict the value of for a new value of . In the simplest approach, this can be done by directly constructing an appropriate function , parametrized by , whose values for new inputs constitute the predictions for the corresponding values of . The key point in this approach is to calculate appropriate values for such that the function best matches for all . Given a model and its derivatives, define an objective function and provide a novel way to calculate first and second order derivatives for all training data. ; this is based on the paper of Wilamowski and Yu, Improved Computation for Levenberg–Marquardt Training. We provide two implementations for the objective function: a distributed implementation based on RDDs for large training sets, and a serial one based on Breeze DenseMatrix for small and medium-sized problems. Implement a Gauss-Newton optimization algorithm with line search, which is more robust than SGD and still shares the same distributed behavior (map-reduce). We also argue that the provided Gauss-Newton implementation performs marginally better than the Limited-memory BFGS (L-BFGS) included in the Scala Breeze package. Apply the above optimization methods to machine learning problems (regression analysis). Machine learning practitioners and Spark users who would like to extend their methodology and test a nonlinear model. There is also room for researchers to devise a stochastic version of the proposed algorithm, where not all training data are presented before each weight update. Optimization practitioners who would like to use and extend a Scala implementation of the Gauss-Newton algorithm. Distributed computing researchers that would like to study the scaling of the distributed computation for the derivatives. will denote the dimensional vector of weights. Notice that in the linear case , whereas in the more general nonlinear case this is not true. A set of pairs . This is usually called the training set. An error function that measures the “closeness” between and . A common choice is the square error . It is common in practice to use k-fold cross-validation techniques in order to reduce the effect of a specific training set on the tuning process. That way the resulting parameters are less biased to the initial training test. The process of modifying the model’s parameters using a training set and an error function is known by several names, depending on the context: in machine learning, it is usually called training; in statistics it is called fitting; in any case, it is essentially an optimization process, since we actually minimize an error (loss) function (possibly with constraints). Since here we are mainly interested for machine learning applications, in the rest of this post we will stick to the term “training”. The objective function in the case of nonlinear modeling is not convex, and it is expected to have multiple local and global minima. So what we gain in flexibility we loose in computational complexity of locating the best minimum. This must be realized by all machine learning and optimization practitioners that use nonlinear models. However, this optimization difficulty is compensated by the increased expressiveness of the model. We also include a method gradnumer(w, x) that numericaly approximates the derivatives grad(w, x). Using this abstract and general definition of a NonlinearModel, we can define any complicated and nonlinear model. Extra care must be given to maintain a mapping between the vector and the specific model parameters. For performance reasons, the user is advised to calculate the derivatives of the model analytically; one only needs to calculate the derivatives of considering constant and differentiate along . Once the output and the derivatives of the model are defined for a single input , the code we present in this post will automatically generalize the output and derivatives for the whole training test. where is the output weight of hidden node , is the bias weight for the hidden node , and are the weights from the input nodes. 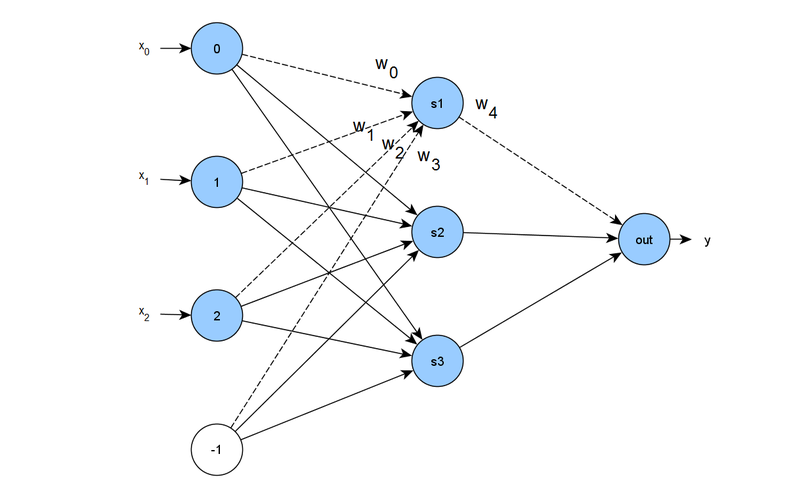 The neural network model is implemented in the class NeuralNetworkModel, shown below, that takes two constructor parameters: the input dimension and the size of hidden nodes . The class extends Serializable, since we want to execute it inside the closure of an RDD (more on this later); it also implements all methods of the trait NonlinearModel we have defined above. where is a scaling parameter, is the center of the distribution, and the covariance matrix is positive definite. In the figure below we present three surface plots of 2D Gaussians centered at . Each plot was generated using a different structure for the covariance matrix . In the first symmetric case is a diagonal matrix will all elements equal. The second case represents a diagonal covariance matrix with different entries in the diagonal, that is slightly elongated in one dimension. Finally, the third case shown above is the general one, where the non-diagonal elements of the covariance matrix define rotation of the shape. For our demonstration here, we implement the second case, where we need only the parameters in the diagonal of the covariance matrix. and has a total of tuning parameters. The implementation of the Gaussian mixture model is presented in the code fragment bellow. We have defined an helper object Gaussian that implements a single Gaussian function: Gaussian.f(x) is the function value, Gaussian.df_alpha(x) is the derivative with respect to the parameter , Gaussian.df_mu(x) the derivative with respect to vector , and Gaussian.df_sigma(x) the derivative with respect to vector . We can provide some test code for the nonlinear models we have presented so far, just to check the sanity of the derivatives. You can donwload the code from here: use the sbt utility to create an Eclipse project as descrcibed in this post; then import the project in Eclipse and run, as a Scala application, the NonlinearModelTest.scala file. * Gaussian mixture with two gaussians. Notice how close the numerical derivatives vector grad numeric approximates the analytical one grad analytic. That’s a good sign! We can now proceed to define the loss (objective) function. So far we have just scratched the surface of our objective: these nonlinear models and their expressiveness will form the basis of the regression process to be described in the next posts. This post is the preamble for a series of posts concerning nonlinear regression modeling using Scala and Spark. Up to the current version 1.6.0, Spark MLlib implements only linear regression models, and in these posts we attempt to provide Spark (Scala) code to extend to nonlinear ones. We began with a quick definition of regression and how it can be viewed either as training or fitting or optimizing. We started scratching the subject bottom up, and described a general implementation of what we call a nonlinear model. 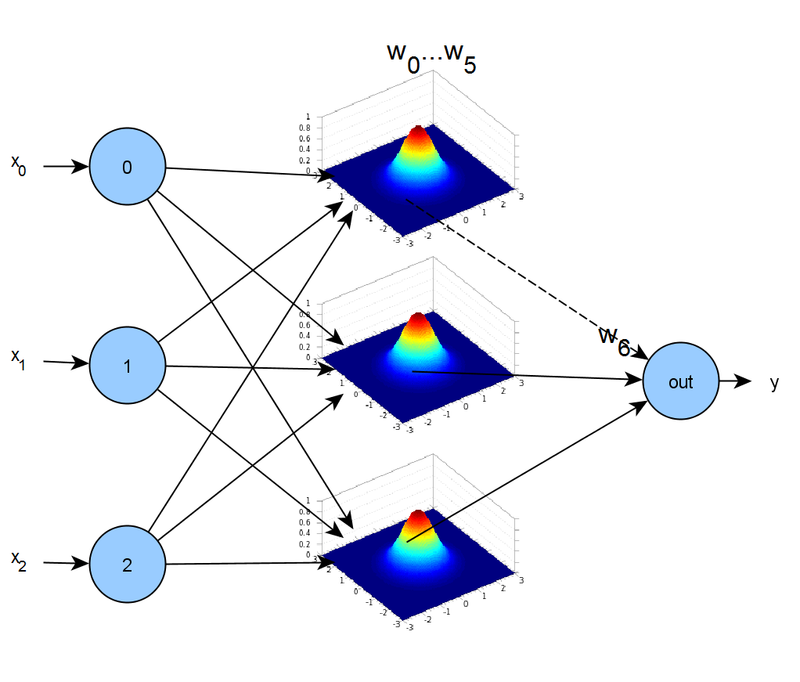 We have also provided two generic nonlinear models suitable for any regression task, namely feed forward neural network and Gaussian mixture model. In the next post we will define the nonlinear objective (or loss) function that must be optimized in order to fit (train) the nonlinear model to sample train data – stay tuned! how to update weights? weights += stepSize*g1 where var (f1, g1) = modelfunRDD.calculate(w) ?